Visiting Ecuador’s Galapagos Islands is a humbling experience; a reminder of how small we are in the context of this beautiful planet and a journey of discovery in one of the most unique places on earth. I have never been anywhere quite like this and the memories I have are unforgettable - not least my memories of our vessel, the Mary Anne, an old-world tall ship! Arriving from Quito, I land on Baltra Island on a Saturday morning, ahead of the rest of my group who would be joining me for the cruise on board the S/S Mary Anne. When my 10 fellow travellers arrive, introductions are made and we board a minibus to take us to Puerto Ayora on Santa Cruz Island. It’s a lovely trip that takes around 40 minutes altogether. You have to take a very short boat and here you get a first glimpse of the amazing turquoise waters that surround these islands. We stop for a delicious lunch in an outdoor restaurant surrounded by wild giant tortoises. I’d only seen them in documentaries and eating next to these gentle and very slow giants is a true privilege – it feels unreal. In Puerto Ayora we visit the Darwin Research Centre which is where most of the scientific research on the islands takes place. It’s also the home of giant tortoises and iguanas. Even if I preferred to see them in the wild rather than in pens, I remind myself how centres like this are vital for the conservation of the fragile species that inhabit the Galapagos. Puerto Ayora is the most inhabited town in the archipelago so it has a very touristy feel, but in its own charming way. In the early evening, we take the water taxi out towards our ship. From the water, the Mary Anne stands out from all other boats; its majestic and elegant masts and billowing sails – it’s completely unique as it’s the only one of its kind in these waters. I’m shown to my cabin and introduced to the crew before we have our first delicious dinner. There are 11 guests on board including myself, a family of 6 and 5 solo travellers. Since the Mary Anne is one of very few boats here that doesn’t charge a single-person supplement , it’s popular with solo travellers. The Mary Anne operates two itineraries that run on alternating weeks - East and West islands - and my departure date is the westerly itinerary. Every morning we wake up pretty early and breakfast is served. It’s usually a hot breakfast accompanied by fresh fruits, juices and homemade pastries and breads. Elizabeth, our guide, is very keen for us to be the first on the landings, so our wake-up time gets earlier and earlier every day! But being here is so exhilarating that I don’t mind the early starts. It never gets crowded when you’re walking around the islands, but there will be other boats with passengers visiting at the same time. All the vessels’ itineraries are decided by the National Park Authority in order to limit numbers of visitors at each location to a maximum of 100. During my trip we hardly ever encounter other groups - all thanks to Elizabeth’s experience in taking less-visited trekking routes. During our itinerary we touch 5 islands including Floreana, Isabela, Fernandina, Santiago and Seymour. In the mornings we do either wet or dry landings with a dinghy, so you have to be fairly comfortable boarding and disembarking a small boat. The crew is on hand to help and they are very good at making everyone feel safe. Once on land, we go for nature walks of about 2 to 3 hours. These are not difficult and you don’t need any particular level of fitness but the terrain can be a bit challenging. I have trainers and all you really need is comfortable footwear with a good grip and strong sole. Many of the walks are on uneven lava terrains, so some of my companions have walking sticks for balance. After our morning walk, we come back to the boat where a light snack awaits us and we change in our snorkelling gear. The water temperature in Galapagos varies throughout the year; I travelled in early June and this is when the Humboldt Current brings cold water from the Antarctic so from June - November the water will be colder. All snorkelling gear is included with your Mary Anne stay but I decided to rent a wetsuit, as the water was just a bit too cold to swim comfortably. Hiring a wetsuit on the boat is inexpensive and means you can make the most of the swimming in these rich waters. There’s no current in any of the snorkelling sites so you don’t have to be a great swimmer and having a wetsuit does help with the buoyancy. The outings are between 30 and 45 minutes, or until we all get a bit too cold to be in the water. Climbing on the dinghy is easy as there is a ladder and when we reach the Mary Anne there is always a hot drink welcoming us back. My favourite is a lemongrass hot tea, absolutely delicious! I’m a keen diver and have been lucky to dive in many places around the world, but here, just by snorkelling you can see so much. For example on the fifth day, at Tagus Cove on Isabela Island, I saw green sea turtles, a flightless cormorant and penguin fishing in the water. I also spotted a sea lion swimming and playing with us, some olden rays and plenty of colourful reef fish. Lunch is normally served buffet-style, outdoors at around noon. The menu changes every day and it is a good balanced meal with plenty of fresh ingredients. The Mary Anne caters for all types of diets if you do request this at time of booking. One of my fellow passengers follows a gluten free diet so the chef always prepares him some alternatives if there is the need. Desserts are amazing and generally served with lunch rather than dinner. In the afternoon we go for another land outing. These are a little shorter than the mornings and tend to be more focused on wildlife – lasting up to 2 hours. In the evening, after the daily briefing regarding the following day, everyone sits indoors around the dining table that Airo, our steward, has set up for a lovely dinner. Chef Adrian never fails to please the group with wonderful plates of food that range from fresh fish dishes to fillet steaks accompanied by a great variety of vegetables. Dinner is a good chance for the group to wind down and relax and chat about the wonderful day. Nonetheless, due to the long days and early mornings, everyone seems too tired to stay up past 9pm! In the Galapagos, every island is unique. One of my highlights was visiting Seymour, with its abundance of birds, from magnificent frigate birds with their crimson balloons and the goofy blue footed boobies with their chicks in every corner. A special highlight was our guide Elizabeth replicating the boobies’ mating sound and a little fella doing the mating dance until he realizes that he is being tricked by a very skilled Galapagos guide! Fernandina, or ‘Iguanalandia’ as we renamed it was particularly exciting, thanks to its famous marine iguanas present in the thousands. This very same island also gave us the greatest gift of all; seeing a sea lion pup being born! Other stand-outs were seeing the moon-like landscapes of Isabela and Santiago, dolphins swimming around the boat on several afternoons and spotting a blue whale and sperm whale while navigating along the Western channel of Isabela. In general, coming to Galapagos is like stepping into a real life natural history documentary whose highlight is nature itself and you are the cameraman every moment of the day! On the eighth day we disembark the Mary Anne and it is a sad moment for everybody. We are already moored by Baltra Island so it’s just a quick dinghy ride to catch the bus to take us to the airport. I have planned to stay a few more days in Puerto Ayora at a family-run B&B, so the following morning I wake up early as I have booked a couple of dives with Scuba Iguana. It’s a fairly long boat ride to the two dive sites, Seymour and Gordon Rocks but worth it as we see hammerhead sharks, schools of golden rays, a sea lion fishing and swimming around us, green turtles and many more fish species! Our dives are very comfortable but diving in Galapagos can be challenging, so I recommend you only go if you’re a confident diver and you book with a responsible company. The Galapagos suit travellers of all ages and are also perfect for families as kids will love the natural displays of wildlife. Compared to land-based options, cruising can be more expensive and living on a boat does not suit everybody, so for some people, island-hopping may be better. However, if you enjoy boats and you can stretch your budget, I do recommend the cruise and I cannot recommend the Mary Anne enough. With the sails up and your tipple of choice in hand, you can sail into the sunset (literally!) anticipating the thrilling encounters, jaw-dropping sights and exciting adventures that await you in this magical place. Interested in discovering the Galapagos? 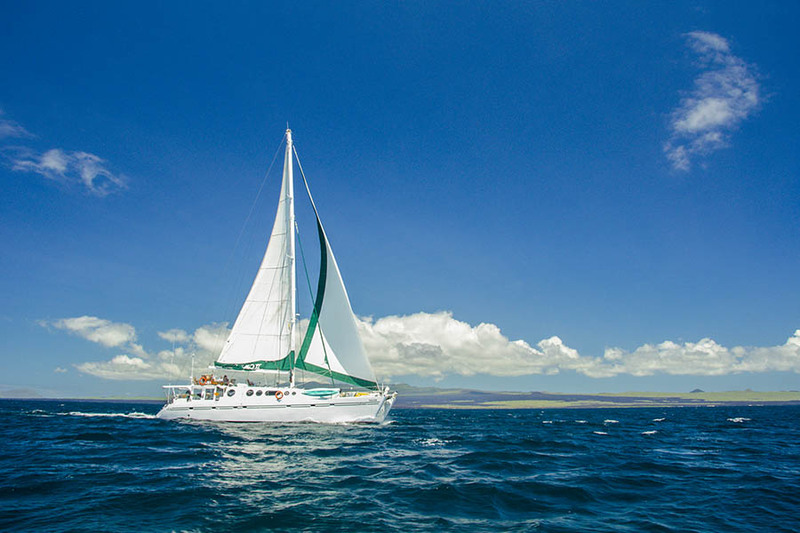 If you like the sound of exploring the Galapagos Islands, but don’t know which type of trip to choose, we can help. We can advise on which itinerary would suit you, in terms of the different islands and what you can find on each. We’ll help you find a cruise or land-based itinerary that suits you perfectly – just call us on +44 1273320580 or request a quote by email.